With PF impact crushers installed as the core crushing machine, Y3S series portable impact crusher can produce high cubic end products. 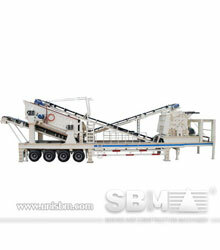 Developed according to novel series stone crushing plants’ design idea, SBM Y3S series portable impact crusher plants are widely used both in coarse crushing and fine crushing. Developed according to novel series stone crushing plants’ design idea, SBM Y3S series portable impact crusher plants are widely used both in coarse crushing and fine crushing. With PF impact crushers installed as the core crushing machine, Y3S series portable impact crusher can produce high cubic end products. 3) Applied as a two-stage crushing and screening system, as a three-stage coarse, secondary and tertiary crushing and screening system, or as three independent units. There are special control box in the whole Y3S series portable impact crusher plant which is equipped with high-tech LCD touch screen and PLC control system.